Going on parental leave can be extremely nerve-wracking. It certainly doesn’t help that you can read a ton of articles on how taking leave can negatively impact your career (like here, here, and here) with little help on how to actually minimize these impacts without “readjusting your expectations”. First, there’s the stress of preparing for leave – discussing replacements, interim processes, etc… Second, there’s the anxiety of being disconnected and cut off from your work and organization for the duration of the leave – will people forget you, will you be missed? Third, there’s the fear of the unknown of what your return to work will look like – will you be able to come back to the same position, is there a risk of being “right-sized”? All of these are very legitimate concerns that should not be dismissed. In fact, being concerned is the first step toward taking action to make sure your fears don’t become your reality. But if you’re reading this, it’s because you don’t believe that there is nothing that can be done to minimize the impact of these challenges. You don’t believe that you need to readjust your expectations because with all the hard work you’ve put in, your entitled to want to secure your position and the career you’ve worked hard to establish all the while growing your family. Many of the fears I experienced during the initial shock of finding out I was pregnant were fears of failure and had to do with the fact that I was faced with a series of significant unknowns for which I seemingly had little control over. But I soon realized that with any situation I have been in, whenever I am managing a large number of unknowns, preparation, communication and accountability have been my best allies in better controlling the outcome. I for one, like winning. 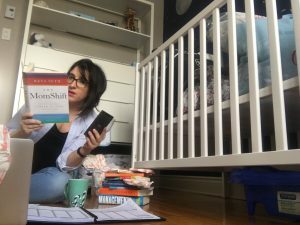 I did not want to fall into the stereotype that most women fall into when they take leave – the dreaded mommy track. In order to avoid this and win, I needed to strategically plan my transition out, my development throughout my leave and transition back to work. By implementing a few simple strategies and carefully outlining a plan, you too can win at baby proofing your career and avoiding the dreaded mommy/daddy track. Preparing to win means that you have some foresight into what you need to do before you leave to ensure the successful and seamless continuity of your work with minimal disruption to your team and organization. The steps you take leading up to your leave are the most important ones in setting you up for a successfully executed parental leave. Make sure to work it out with your boss and HR to be actively involved in all stages of the recruitment process for your replacement. There is no better judge of what it takes to fulfill your role than yourself. If your organization will not be replacing you with any one person and would rather split up your role and responsibilities among many people within your team, be prepared by having identified whom you think would be best suited for which tasks, assignments or projects. This will demonstrate that you have a vested interest in ensuring the continued success of your team during your absence and that you are not putting the burden of the transition planning work on your supervisor but that you are taking responsibility for ensure a seamless transition. Just like a big employment gap can have a negative impact on your career progression, so too can a long and disengaged parental leave. Remaining connected with what is going on at work as well as engaged with developments in your industry or profession will be key to demonstrating that you are committed to what you do, committed to your team and committed to coming back stronger than when you left. This will help to build your credibility in the face of the challenges that we mentioned above. The more effort you put in to make the transition seamless and forward-looking, the more successful you will be at securing your place at the table when you return. Identify personal and/or professional goals that you want to accomplish while away on leave that are achievable and strategically selected to enhance your value both within your current role and organization but which are also transferrable and make you a more attractive candidate to prospective employers. By showing your commitment to continuous improvement, you’re sending a very clear message about your intent to be an A-player on your team. Set your expectations around how often you want to communicate with your supervisor (and a select few colleagues) during you leave, the type of touch points you’d like to have and what you expect to discuss. Maintaining a connection to what is going on at the office will ensure that you don’t become a ghost, show your dedication and keep you abreast of any changes that could potentially impact your return to work plan and give you enough time to react appropriately. Just as though you were in the office, continue to manage up and communicate any and personal and professional accomplishments to your superiors while you’re off. The fact is that your supervisor will look good if they have an A-player on their team, so be sure that they will be disseminating all updates you provide to their superiors to demonstrate that they have a winning team both in and out of the office. Negotiate to keep your blackberry and laptop, if applicable, so that you can read emails going back and forth throughout your absence to keep on top of discussions, decisions and developments as they pertain to projects and tasks that you were involved with. This will ensure that you don’t miss a beat and will set the stage for coming back to work with up to date knowledge on various topics. It also provides the company with an opportunity to communicate with you for answers or help being directed to the appropriate resources to save time in continuing your work. Network. Take advantage of your schedule to be more flexible to meet with people that you want to catch up with professionally. This could be a great opportunity to explore different career avenues, have those informational interviews you were meaning to have and make connections to pursue personal and professional goals. Increase communication with your supervisor and colleagues a few weeks before your expected return to work date. Use these opportunities to understand in what capacity you will be coming back to work (i.e. : in what type of role). Once you know this, you can start contacting key resources for additional information on what is currently going on in that sphere, get all the IT logistics organized and out of the way (make sure you have a computer, desk, phone when you get back) and start to strategically prepare for hitting the ground running when you get back. With an understanding of what your back-to-work plan is going to look like, you’ll be better able to work out a child care plan, test out new routines that work for you and establish a support system to successfully go back to work with peace of mind. With all the preparation you have done to put in place a strategic plan for a seamless transition, you can rest assured that you have taken all the right actions to show your commitment, leadership and intention of ensuring a successful leave for both yourself and your organization. Whatever the outcome, whether you return to work in your previous role or not, you’ve baby proofed your career in a way that allows you to re-enter the workforce better than when you left. It’s important to note that being accountable to your goals and outlined plan is key to ensuring your success. With routines being thrown off with the arrival of a newborn, make sure you have the support system you need to stay committed to your plan. Anticipate challenges that you can encounter and employ the help of a trusted friend or family member to hold you accountable to your goals and who can offer the resources or support you may need. IF YOU WANT HELP CREATING A DETAILED PERSONAL AND/OR PROFESSIONAL DEVELOPMENT PLAN, OR SIMPLY WANT SOMEONE TO HOLD YOU ACCOUNTABLE, ANGELA IS A CERTIFIED PROFESSIONAL COACH AND CAN HELP YOU ACHIEVE YOUR GOALS. CLICK HERE TO GET IN TOUCH! What were some of the things that you found helpful in planning and managing your career progression during parental leave? What did you find was the least helpful advice you received? Was this article helpful to you?